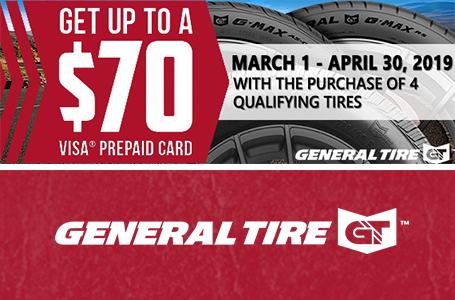 Receive up to a $70 General Tire Visa Prepaid Card with the purchase of 4 qualifying General Tires from 3/1/19 to 4/30/19. Go to www.generaltire-rebates.com to enter your claim online by 5/31/19. Late submissions will not be accepted. Online submissions are processed faster.